We are thankful to our sponsors/donors for supporting the lab. Ultimaker for being our official supplier of printers at the Lab and a partner in the 3D Printing MOOC being developed for Coursera. They have donated two ultimaker originals and an ultimaker 3 to us, and support our lab in other ways. MakeShaper for sponsoring the #FreePrintWednesdays, as well as the #PrintAPerson campaign. Autodesk Fusion 360 was the Official Sponsor of the “Fusion Fellows ” program at the MakerLab for Fall 2015, with a $7500 gift. They have launched the Cool3DModel initiative to help promote modeling skills on campus.They are also our partner in the 3D Printing MOOC being developed for Coursera. Intel has donated their new galileo boards for expanding our digital making practices. P&G supported the ‘Making Things’ class in Spring 2014 with a $6,900 grant. Podio is sponsoring our internal project management platform to keep track of order, sales, design and orders. Dremel has kindly donated a 3D printer to us for testing purposes. Simplify3D for additional software licenses in the lab. 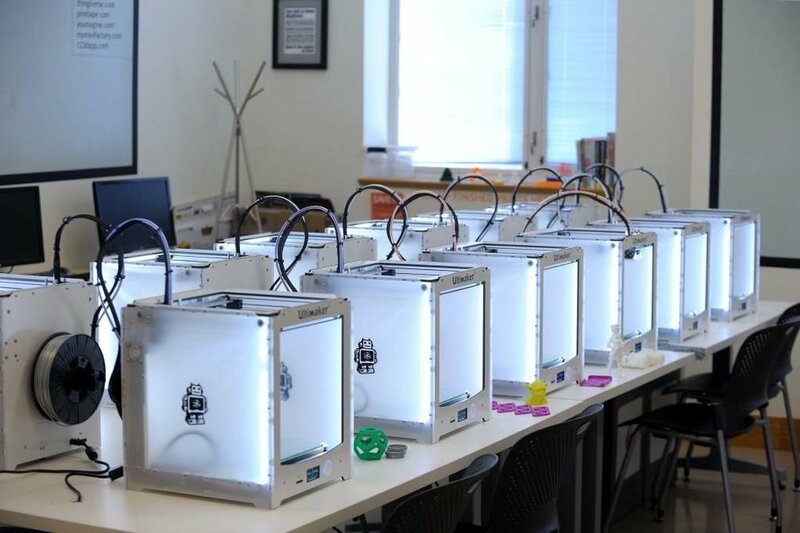 Dynamism has donated Ultimaker Printers for our Champaign Public Library outreach project. Do consider donating to the MakerLab. Or if you would like to explore sponsorship opportunities, please download our opportunities guideor Contact us. UI Innovate : UI Innovate is a RSO, set up to leverage “Maker” resources across campus. They emerged out of the MakerLab, the country’s first business school based 3D printing lab. The club has since sought partnerships with other labs around campus that offer access to new technologies. UI Innovate seeks to introduce students to these new technologies in order to discover novel applications that will drive their proliferation. While the organization emerged out of the business school, we seek students from all backgrounds with an interest in driving technological growth. Maker Girls: Maker Girls is a student run organization that introduces 7-10 year old girls in the Champaign-Urbana area to the exciting world of STEM fields through 3D printing and creative activities. EntreCorps: EntreCORPS is a student-managed consulting organization created for the purpose of providing business strategy advice to entrepreneurial start-ups. If you are interested in partnering with us, we would love to chat.